No peanut, your guru does not smoke pot nor has he gone to pot. Not as yet at least. I use two types of pots at my home. The smaller one on the left is a glazed clay pot that I use to store one particular type of pickle for which it is the best container. I am told that it is the best for other pickles too, but I hardly ever eat other pickles. The other larger one is an unglazed clay pot in which I set yogurt. The end product, using cow’s milk is good enough to kill for. If you don’t believe me, please come over for a taste of it. This entry was posted in Blogging, Food, India and tagged Padhu's kitchen, Vadumangai pickle, Yogurt. Bookmark the permalink. 9 Responses to Going To Pot. Interesting – what kind of pickles? I love pickles. What makes your yogurt so good?? If you click on the word pickle, there is a link to the pickle that I have stored in the pot. well I like my guru to have feets of clay every now and then! but pots of clay? 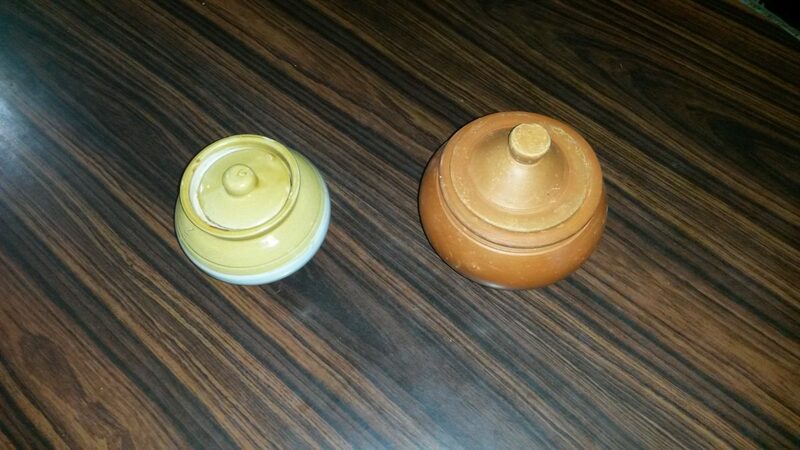 though cute little pots they are. I love pickles too just like Shack. my favorite are bread and butter pickles. and I have no idea why they’re called that. guess I will need to google it. and a good dill pickle. they used to sell huge ones in the movie theaters. but they were so stinky to sit by if someone were eating one! almost turned me off pickles! this post makes me grin. I am glad that it made you grin. That was the purpose of the post. I don’t eat pickles anymore, but I do eat yogurt. How exactly do you make it? How much at one time? I heat up one litre of cows milk till it comes to boil and allow it to cool down for about twenty minutes. I add a table spoon of the previous day’s yogurt at the bottom of the pot and pour the warm milk into it. I stir it to mix the starter and the milk and put the pot into a thermos casserole for about six hours. The yogurt is now ready to be transferred to the refrigerator. I have three pots and when one gets empty which is once in every three days, I set it. There are always two pots inside the fridge. anyway I have “issues” now with pickles, although I can manage a small smearing if required. I too have a certain little pottery container, not with a lid that I use for one particular food item…which has to be covered because of migrating smell…but usually the item gets eaten quickly. What smell? Food usually is aroma! !